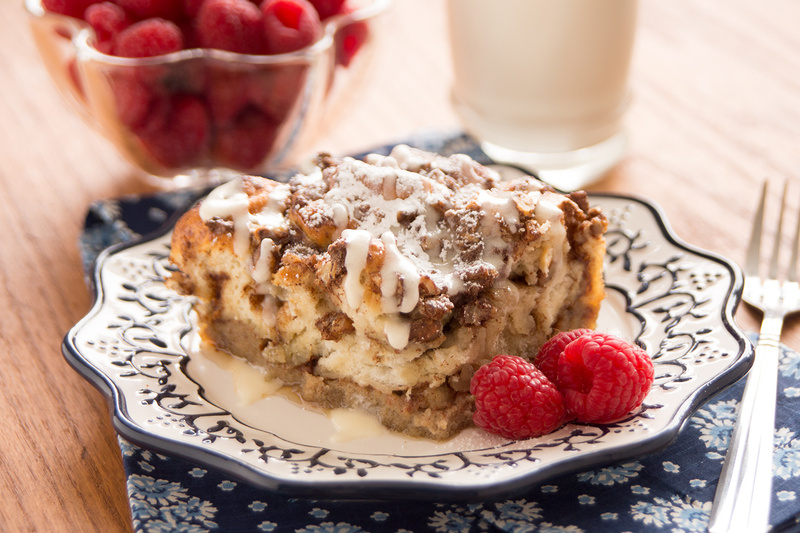 A delicious French Toast made with delicious Cinnamon Rolls! What could be better? Cut each roll into 8 equal pieces and arrange evenly in a sprayed 9×13 inch baking dish. Drizzle with melted butter. Whisk together eggs, cream, cinnamon and vanilla until well combined and pour over roll pieces. Sprinkle with pecans and drizzle with maple syrup. If using Anytime Cinnamon Rolls, bake immediately at 375 degrees F 25-30 minutes. If using traditional Cinnamon Rolls, let rise until double in size and bake as above. Cool slightly. Recipe will sink while cooling and excess syrup will pool in bottom of pan. Serve drizzled with frosting, maple syrup and dusted with powdered sugar. This looks tremendously yummy, but I’m concerned about healthy foods. It would be a step forward to present healthy yummies I believe. Some food for THOUGHT! Thank you for your suggestion. We do have many other recipes on our website that you might enjoy trying!